The long-awaited report from the Trump administration’s school safety commission is being met by a chorus of criticism from the California education community, with state officials and representatives for school administrators joining youth advocates and union leaders in decrying some of the report’s key recommendations. Headed by U.S. Education Secretary Betsy DeVos, the commission was convened by President Donald Trump following the February 2018 massacre at Marjory Stoneman Douglas High School in Parkland, Florida, in which a gunman shot and killed 17 students and staff members. It quickly generated controversy as DeVos refused to allow testimony focused on gun control, which had become a rallying cry for victims of the shooting. 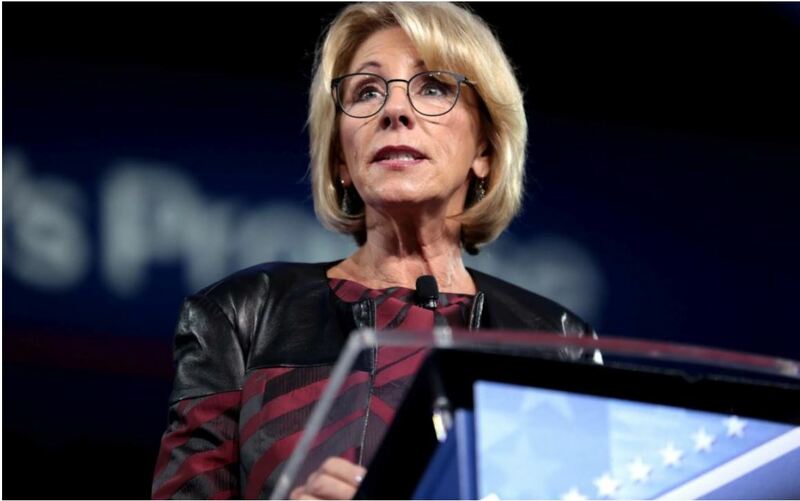 DeVos then angered civil rights advocates by signaling the commission would recommend scrapping President Barack Obama-era guidelines aimed at protecting racial minorities and students with disabilities from unjust policies that caused them to be disproportionately disciplined. On these fronts, the 180-page report released Dec. 18 contained few surprises. It strongly recommended rescinding the Obama administration’s “Rethinking School Discipline” policies issued through the Education Department’s Office for Civil Rights in 2014, which emphasized alternatives to suspensions and expulsions and highlighted data showing that students of color and those with disabilities were up to three times as likely as white students to face these punishments, often for similar nonviolent offenses. While avoiding the subject of race, the DeVos panel recommended some of the same discipline alternatives, like Positive Behavior Intervention Supports (PBIS), which focus on creating more positive school climates and improving social and emotional learning. As of January 2019, it will be illegal in California for anyone under 21 to purchase firearms unless they are in the military or law enforcement. Other states, including Florida, have passed similar laws. The report’s conclusions will have little or no impact on California policies regarding school discipline or the presence of firearms in schools. The state has some of the nation’s strictest gun control laws and, in recent years, emerged as a leader regarding discipline reform. Among other things, California has banned so-called “defiance and disruption” suspensions in grades K-3 and suspension rates are among the statewide indicators on the California School Dashboard, the state’s accountability system. These efforts have contributed to schools statewide suspending about half has many students as they were just six years ago, according to recent data. Nonetheless, education leaders and youth advocates across the state harshly criticized the report for its priorities and the message it sends to districts that have been slow to embrace discipline reform. Torlakson did credit the panel for encouraging states to adopt laws similar to California’s so-called “red flag law,” which allows law enforcement and immediate family members to petition a judge to temporarily remove guns and ammunition from a person they see as a threat. Others described the report as hypocritical because it advocates for alternatives to traditional discipline while opposing the Obama guidance on discipline disparities. They also point out that the Trump administration’s budgets have cut rather than increased money for teacher training on discipline alternatives. “You can’t have a conversation in this report about mental health and training teachers on PBIS and then have a proposed budget every year that cuts money for professional development for teachers,” said Adonai Mack, senior director of federal relations for the Association of California School Administrators. Eric Heins, president of the California Teachers Association, the state’s largest teachers’ union, said he was puzzled by a section in the report that promoted the U.S. Department of Defense’s “Troops to Teachers” program, which helps former soldiers transition into careers in education. Regarding discipline, if, as the New York Times has reported, DeVos rescinds the Obama guidance, she will in essence be rejecting the previous administration’s interpretation of federal regulations established after the landmark 1964 Civil Rights Act, Losen said. These regulations outlaw policies that have an unjustified “disparate impact” on racial minorities. The Obama discipline guidance said policies that cause disproportionate suspending of students in protected groups that is unjustified violates the regulations. By rescinding the guidance, the Trump administration is signaling that it will turn a blind eye to the many districts with dramatic differences in discipline rates that are being caused by unjustified policies, Losen said. Losen, however, was among those who were quick to emphasize that nothing in the report changes current state policy. California Attorney General Xavier Becerra is free to continue interpreting the regulations based on the Obama administration’s guidelines if he chooses. Also concerning, say Losen and others, is that the Education Department under DeVos continues to scuttle civil rights investigations that were begun during the Obama years. In June, the investigative news organization ProPublica reported that DeVos’ department ended at least 1,200 investigations that had been ongoing for six months without finding wrongdoing. While Losen said he has “faith that most educators will continue to address unjustified racial and disability disparities,” he worries that the report could “stiffen the backbones of superintendents and principals who are old-school believers in harsh policies and have resisted the overwhelming research” that they disproportionately hurt minority students.